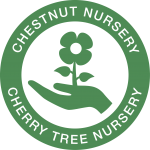 Cherry Tree Nursery is a commercial garden plant nursery growing perennials, climbers, shrubs, grasses, bamboos, ferns, herbs, conifers, and trees for sale to the horticultural trade and to the general public. Cuttings are taken and seeds sown in a large greenhouse, then potted into liners and moved into one of the ten polytunnels, where they are grown on and potted up ready for sale. We have a small shop which functions as an informative sales area for members of the public. The nursery was Cyril Speller’s idea. His humanity, commitment and dedication to the welfare of the neglected and forgotten enabled the project to bear fruit. Up until twenty years ago, many people assessed as having a severe and enduring mental illness spent their lives confined in large mental institutions, formerly known as ‘lunatic asylums’ or ‘madhouses’. In the 1980s, it became government policy to close many of the large psychiatric hospitals and for the ex-residents to move to live in the ‘community’. This policy was known as ‘Community Care’, and aimed to restore more ‘normality’ to people’s lives. While living in the institutions, many of these people had been usefully occupied in growing their own food in the hospital grounds, or making furniture in the hospital workshops. A group of committed people, who had been working with the mentally ill in a voluntary capacity, became very concerned about the implications of this profound change on the people involved, especially as they believed there was no ‘community’ for them to move into. They came together and commissioned a survey to see which aspect of their lives people with mental illness, who were moving out of hospitals, most wished to change. This identified the great need for meaningful occupation to restore purpose and meaning to people’s existence. A realistic form of work would give structure to their day, the opportunity to make new friends and develop social networks, give them the dignity associated with working, and the chance to regain the lives they had lost due to illness. 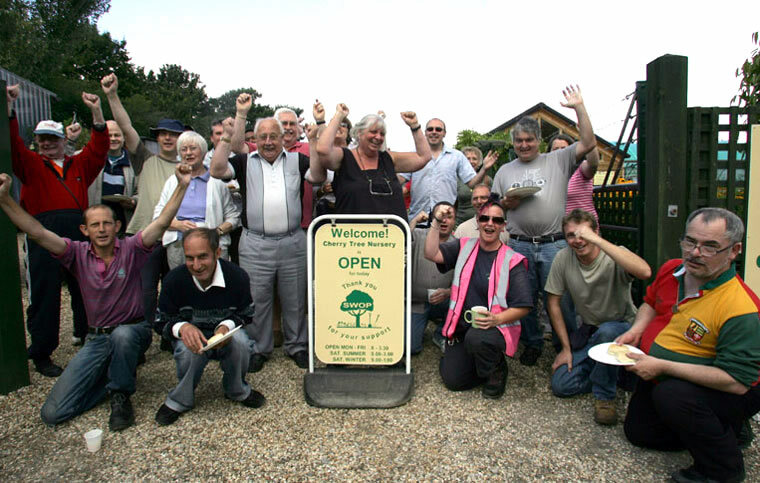 A registered charity, the Sheltered Work Opportunities Project, was established in February 1990. Due to the generosity of Bournemouth Borough Council, a site was leased to set up a commercial plant nursery, originally designed to grow plants for the landscape market. The project was named Cherry Tree Nursery. An interest-free loan of £1,000 was secured, and an old portacabin donated. On 15th April 1990, four volunteers, a manager seconded for 3 days a week from the Dorset Healthcare Trust and a dog, moved in to the wilderness soon to become a nursery. At first it seemed impossible for the project to survive. The site suffered constant break-ins and vandalism. There were no resources, and our technical knowledge and experience were limited. But if Cherry Tree proves anything, it shows that if you believe strongly enough in something, it will happen. The project started to attract the friends and supporters who have made our growth possible. 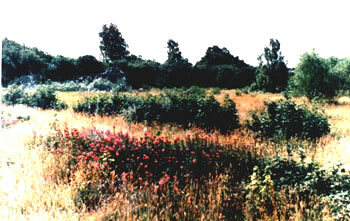 In the early days the site was totally overgrown and derelict, and only half of the present site was available to Cherry Tree. Since then the volunteers totally cleared, drained and levelled the site, installed water, electricity and telephones, and erected all the tunnels, buildings, beds and paths you can see today. 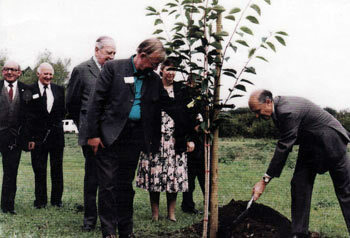 In 1995 the Council granted Cherry Tree the remainder of the site and, after clearance, the project expanded into the whole site. Cherry Tree now produces over 100,000 hardy shrubs annually, and has up to 150 people attending at any one time.